For all the Hurl haters. For all the Hurl haters, I believe this is pretty darn good of him, he may not be the best but he sure is not the worst player we have ever had. 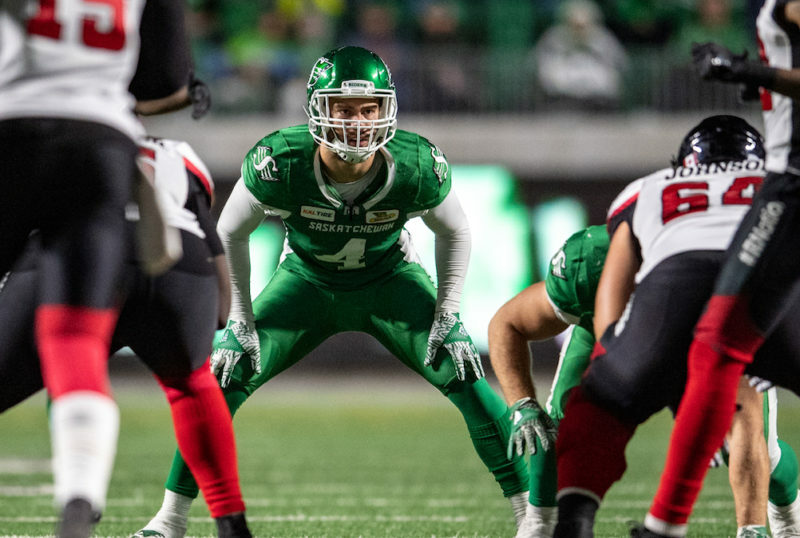 Communication has been vital to the success of the Saskatchewan Roughriders’ middle linebacker this season. 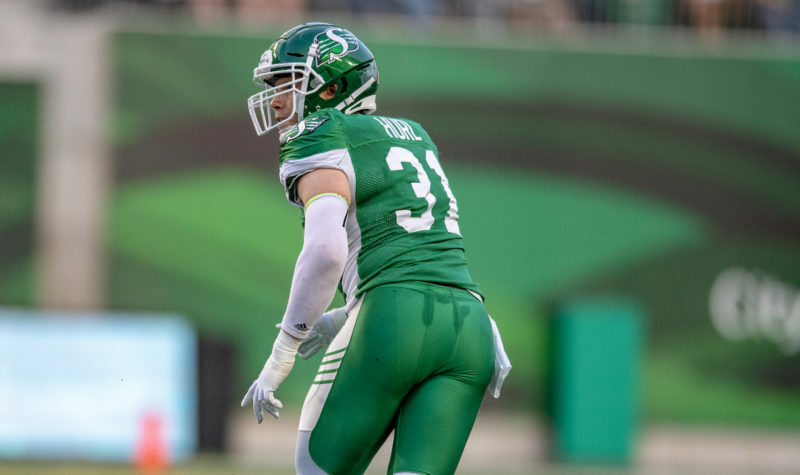 Sam Hurl, who started the 2018 CFL campaign at that spot, talks regularly with Cameron Judge, who has been getting more playing time at that position in recent weeks. Judge is in his second season with the Roughriders, who selected him in the first round (second overall) of the 2017 draft out of UCLA. He played in just three games in ’17 due to a shoulder injury that required season-ending surgery — and those three games primarily were spent on special teams. Hurl, 28, is in his seventh CFL season. When the University of Calgary product suits up for Saturday’s game against the B.C. Lions at Mosaic Stadium (5 p.m., CKRM, TSN), it’ll be the 108th game of his CFL career. Hurl began his run with the Roughriders in 2012 and spent three seasons with them before joining the Winnipeg Blue Bombers in 2015. After three campaigns with the Bombers, he signed as a free agent with Saskatchewan in February. “Cam Judge is a smart-enough guy to look around at a guy who is a vet and learn from him,” Jones said. Hurl and Judge sit beside each other in the Roughriders’ locker room, which allows Hurl to provide insight to his younger teammate. Linebacker Sam Eguavoen also is in the vicinity, so he and Hurl have tried to be resources for Judge. That’s not to say that Hurl is continually telling Judge what to do. The veteran believes that on-the-job training is more beneficial to a younger player than having someone in his ear all the time. “I try to (mentor Judge) a bit, but ultimately what I think this game is all about is getting the experience on the field and getting those reps,” Hurl said. Those opportunities have become more and more prevalent for Judge. After seeing duty as Hurl’s backup in the early stages of the 2018 regular season, Judge is more likely to start games now — and the change in responsibilities is evident on the stats sheet. Over Saskatchewan’s first 10 games, Hurl had 31 tackles and Judge had 19. Over the team’s past seven games, Judge had 21 tackles and Hurl had 10. Entering the Roughriders’ final game of the regular season, Hurl is sixth on the team with 49 defensive plays (41 tackles, six special-teams stops, two tackles for losses) and Judge is seventh with 48 defensive plays (40 tackles, three special-teams tackles, two sacks, one forced fumble, one knockdown and one tackle for loss). Judge’s volume of stats may be increasing, but his volume isn’t. And Hurl expects that to continue. Judge believes the biggest progression he has made this season is in his understanding of the CFL game and teams’ tendencies — and his background makes it easy to see why he faced a learning curve. He was born in Montreal and played minor football in the Vancouver area, but his high school training occurred in Thousand Oaks, Calif. Then he went to UCLA, so his formative years in football were spent in the United States. Combine that with the injury Judge suffered last season and it’s easy to see why he’s still figuring out the CFL. He can thank Hurl for helping him, even though that assistance cost the veteran some playing time. Pick your battles small enough to win but big enough to matter. Hurl sounds like the epitome of a team guy! Like it. My fav alumni to listen to on the radio is Mike McCullough and he is always singing the praise of Hurl. Ps Mccullough comes across as a real stand up guy! He fits in a lot better with Jones' defence then he ever did with Hall's. The Bombers simply wanted more out of Hurl then he could provide but with the Riders he plays a key role in a strong team defence. He doesn’t play a key role at all, that’s one of the big differences for him with the Riders. He plays a secondary or complementary role in a strong defense, which is why it’s working. I don't think anyone has ever questioned his character, work ethic or how good of a teammate he is. The "haters" bring up issues of his on field play. This article, although good to hear he is helping Judge, really does nothing to the "haters" as it really doesn't change his onfield play. Yeah, he's a team guy for sure, and I think that idea big deal to Jones. It is a huge factor in a guy like Steele, for example. Team first, strategy with multiple positions, and accolades and flashy stats somewhere way down the l8ne because of it all. I've always been back and forth on Hurl. I was iffy on him, but he has exceeded my hopes this season for sure. and yeah, Mike's talk on him made me rethink Hurl some. He talks his football IQ a lot. I had a pile of respect for Mike and felt he was grossly underutized as a player. I think the way the ratio has shifted some recently that he would be a regular starter now. I remember sitting at a table with McCullough at the Balgonie Wildlife Supper, of all places, years back when Hurl was still here for his first tour and Mike said that Sam was the smartest young linebacker he'd ever met. Basically, between the lines, drew parallels between himself and Hurl - but guys who may not have the athleticism of others but can make up for that with their brains. I don't believe Hurl had ever played on a pro level other than under a Richie hall defence under which he didn't do that well. However, he's now part of a really good defence and seems to fit into that scheme very well, at least IMHO. Year two will see him mostly watching Judge play. He’s officially very much a back up now. It’s Judges job.